Albert Trott is one of the few distinguished players to have represented two countries in Tests - Australia & England. He was adjudged as one of the Wisden Cricketers of the Year in 1899. Over and Out is the remarkable story of a neglected cricket hero. Albert Trott was good enough to play for Australia and England, but at the height of his powers no Test team would pick him. He brought an Ashes series to life by bagging 8 for 43 on debut at Adelaide in January 1895. Thanks to his outstanding bowling effort (27-10-43-8) in the second innings apart from posting an unbeaten 38 in the first innings and an unbeaten 72 in the second innings, Australia had defeated England convincingly by 382 runs. No other all-rounder in the history of Test Cricket has managed 100-plus runs and captured eight wickets (apart from three catches) on debut. His batting average for Australia in Tests was 102.50 - his tally being 205 runs in five innings (three times not out) with a highest of 85 not out in exactly two hours vs England at Sydney in February 1895. He remains one of the two bowlers to have accomplished two hat-tricks in the same first-class innings - for Middlesex vs Somerset at Lord's in 1907. Joginder Singh Rao is the only other bowler to achieve the distinction - for Services vs Northern Punjab at Amritsar in 1963-64. 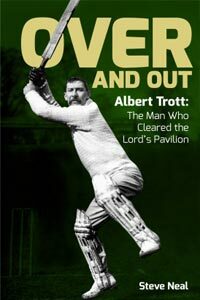 Over and Out celebrates Albert Trott's exploits on the field, which for far too long have been hidden by the taboo of suicide. It also addresses the mystery of Albert Trott, how he responded to the external forces that fashioned his life and ultimately why he did what he did. Despite being the first and still the only batsman to hit the ball over the Lord's pavilion, there is no portrait of Albert Trott in the Long Room in the Lord's pavilion. His cricketing feats have been largely unacknowledged. It is time for him to take up his rightful place in the history of the game. This splendid publication includes research from the Lord's archives and photographs that have not been seen for many years.